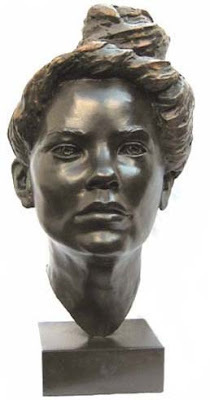 My name is Mary Quinn and I specialize in sculpting Portrait Busts in Clay. I am currently teaching a student who has never sculpted in clay before, she has however had some experience in wood carving. Through a series of photographs and explanations, I will take you through her journey from the "Empty Armature" to the "Finished Head" in clay. Then I will show you how we made a 2 piece plaster mould and finally how to cast this head in resin bronze and patinate it (give it a finished colour) and mount it on a plinth. As in the manner of the old Masters who gave their students a Roman head to copy I gave my student a sculpture of mine to work from, (see above) called Jade. We will follow Jade's progress from the clay to the bronze. As this is a teaching Blog for all you struggling and aspiring sculptors out there, I will take you slowly through the processes. Feel free to copy and take notes. I am very happy to answer any questions. I have been sculpting for 25 years and know how daunting it is to get started. I hope this will give you the confidence to get stuck in and give it a go. This is just an introduction and I will start tomorrow with an empty Armature and explain how you can make one yourself with photos of all the materials.